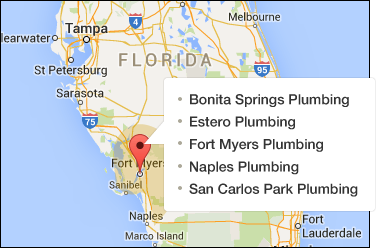 Emergency plumbing and drain services in Bonita Springs, FL. Call (239)249-8402 now. Looking for a fair, honest and dependable emergency plumber in Bonita Springs? A plumbing emergency can arise at anytime, at Moen Brothers Plumbing & Drain we realize your immediate need to speak to a plumber in Bonita Springs during an emergency. That is why are phones are answered by an actual Bonita Springs plumber, never an answering service. Call now to get your questions answered and know your technician is on his way. What your 24/7 Emergency plumber can do. Having a plumbing emergency at your Bonita Springs home can be frustrating, many of these emergencies can be avoided with regular maintenance. Water heater should be replaced when they reach the age of ten years old. Toilets should be completely rebuilt every 5-10 years. Where these fixtures are located may help you decide if you will replace it earlier. Water heaters installed in the corner of a garage are less likely to cause a major flood inside your home. Ensuring the valves to these fixtures works properly could save you an emergency plumbing call. Make sure each and every member of your family or office staff know the location of these shut off valves. During an emergency plumbing situation, seeing the water stop after closing a valve can be relieving and save you thousands of dollars in water damage. If your are experiencing a plumbing emergency in Bonita Springs, do not hesitate to contact your friendly, professional and dependable Bonita Springs plumbers at Moen Brothers Plumbing & Drain. We stand ready to solve your plumbing emergency at any hour with fully stocked trucks and the latest equipment like sewer video inspection cameras, slab leak detectors, and many sewer and drain cleaning machines to aid our diagnosis.